Ten-year-old Steve longs to be poor and neglected like his friend Wally, whose parents are incapable drunks. But unfashionably for Steve, he's saddled with a conventional, stable and middle-class family. Then, over the course of a year, his father has a fling with a barmaid and leaves home, his mother's response is to start a psychology degree, his sister is arrested for demanding money with menaces and his brother gets a girl pregnant. A funny, touching and heart-warming debut novel that will strike a chord with anyone who has been an awkward kid at least once in their life. 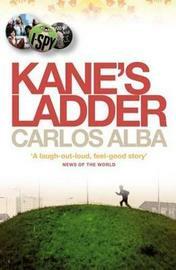 Carlos Alba is a journalist who has worked in Scotland for the past 17 years. He has been editor of The Sunday Times (Scotland) since September 2006 after five years as deputy editor. Prior to that, he was Scottish political editor of the Daily Record and education correspondent at The Herald. He has won five Scottish Press awards. In 2001 he co-authored with Ron Mackenna Keep the Faith: The Story of Celtic's Historic Treble Winning Season 2000-2001 (Mainstream).